FlutterbyeFaery Designs: Birthday Bag Special! 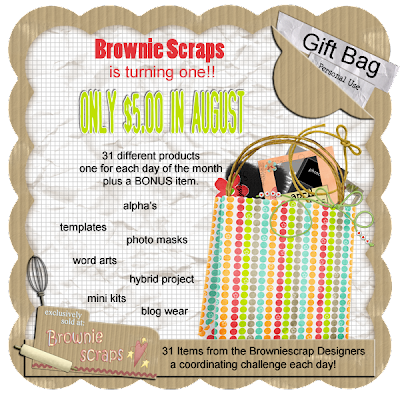 Brownie Scraps is turning one! Come celebrate our Birthday Bash in the month of September with us! We have created a packed full Birthday Bag with a product per day (and one extra). There will be challenges posted each day connected with the products you'll find inside the bag! Individually the products in this bag would sell for well-over $50.00 total, but you can get it in the month of August for only $5.00!There are lots and lots of goodies from mini kits to word arts to frames to tags to photo masks to templates and many many more! Get your bag today! The price will double in September!